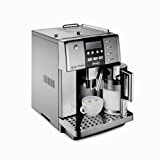 If you love coffee but aren’t quite sure you have the confidence to make espresso by yourself, then super automatic espresso machines (also called a fully automatic espresso machines) could be the right choice for you. These machines will do it all! They are fully automated and many will even grind your coffee for you, add things like frothed milk, then put your used grounds in a place where you can take them out later. These are among the most expensive type of espresso machines out there, but they’re great for folks who don’t have the time or energy to focus on their coffee but who still want that perfect up every day. Sometimes, you have to spend a little money to get what you want, and this is the case when it comes to automatic espresso machines. Fortunately, there are many super automatic espresso machines available, across many price ranges. Most super automatic espresso machines will do as much of the work as you want them to. They’ll grind the coffee, make sure each cup has enough, tamp it, brew it, and even get rid of the used grounds when the process is finished. You’ll have to tell the machine how much espresso you want and you may have other options as well, but after that you can just stand back and let the machine do its magic. Unlike the semi-automatic, super-automatics aim to give you as little control over each cup of coffee as possible. They don’t do this because they don’t trust you, though, but because the machine can do everything the same way every time. This takes away human error, though it’s up to you as to whether this is better or worse than having control over each cup. DeLonghi is the king of these machines, at least in the United States. Therefore, most of the best super automatic espresso machines are made by them. They are a company that many people have come to trust over the years, and their best super automatic espresso machines are fan favorites. This machine manages to balance a wide range of features with a reasonable price. It’s definitely easy to use, as it will make both lattes and cappuccinos with its Cappuccino System frother. No longer do you have to worry about mixing steam and milk to get the perfect froth, because this does it for you every time. In addition, this machine will grind your beans and use them instantly, so your espresso is always fresh. The control panel is a combination of rotary and push-button control, so it’s easy to access and change programmable menu settings including start time, auto off, temperature, coffee strength, clock, and cup size. The ESAM3300 also allows you to adjust grind settings and offers a compact, removable brewing system so that you can access it and clean it easily. And you won’t have to wait for the milk to froth to make your espresso into a cappuccino because the machine offers a double boiler system. Let’s have a closer look in the [DeLonghi ESAM3300 Magnifica Review]. As the name implies, this machine is similar to the one above. It offers a similar control panel that’s easy to understand and use, and it also takes beans directly from the grinder to the brewing system, so your espresso is always fresh. This machine is more expensive but some extra special features make a big difference. This machine is the digital version and also offers the “Single Touch” hot milk system. All you have to do is slide the milk tank onto the front of the machine, and you’re ready to go. And it has a clean button, so maintenance is a snap. It also offers loads of other features to enhance your espresso brewing experience. It has cleaning-indicator lights, a hot water spout, and a cup warmer, to name a few of these features. Both the large water reservoir and the coffee container are removable, for easy access and cleaning, and it has a heat-adjustable coffee spout. All of these features combine to make sure you get the best cup of espresso possible. [Read The Full DeLonghi Magnifica ESAM3500 Review]. This machine is called the “Gran Dama” and it certainly is the Grand Dame of DeLonghi’s line of super-automatic machines. Not only does it offer much of what both of the previous machines offer, but it has a full 1350 watts of power and 15 bars of pressure. It is made to distribute the heat well, utilizing top-of-the-line Thermoblock technology to make sure your espresso is always at the right temperature. The machine is fully programmable, and the menus are simple to access and to understand. Most of the parts that can be taken out and cleaned are dishwasher-safe, making your job of maintaining your purchase even simpler. It has a conical burr grinder, which is one of the best in the business, and takes your coffee directly from grinder to brewing. Clearly, this is a machine for a true coffee connoisseur. The Gaggia Brera Superautomatic really is a nice super automatic espresso machine; it has a small foot print that could leave you with lots of countertop space. The Italian Brera is carefully designed to optimize user efficiency. The dregs compartment, drip-tray and water tank are all accessible to the front of the appliance, just for simple and fast cleanup as well as maintenance. Push button settings and an LED display using illuminated symbols ensure it is simple to navigate through the options, which are many on the Gaggia Brera. Espresso aroma, strength, as well as volume can be customized. And the grinder will take advantage of the adapting system to adjust the revolutions per minute to ensure the correct amount of coffee grounds. The Brera is definitely a great looking machine with a stylish brushed stainless-steel front panel. The side sections can be purchased in black or silver to enhance your interior decoration. The Gaggia Brera is excellent for entertaining as it will support a multitude of user choices and the compact design and style is far more space efficient compared to the majority of machines in the class. Should you choose to serve visitors pre-ground decaffeinated coffee, or classic coffee you can do so using the by-pass doser. 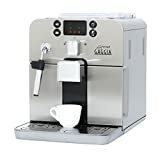 Specialized treats like cappuccinos and lattes can be produced effortlessly and speedily, because the Brera comes with a stainless-steel Panarello steam-wand with Rapid Steam Technology. Italians know their espresso and this Italian made machine does espresso well. The name is the first indication of the quality you can expect from this machine but it doesn’t end there. The Saeco 4038 Vienna Plus Super-Automatic Espresso Machine comes in either silver or graphite, which makes it easier to fit into your kitchen decor. The interface on this particular Saeco espresso machine is easy for users to use and you can use the machine to brew espressos, lattes, tea, coffee, and cappuccinos. But this machine does so much more than that. In an effort to provide even more convenience to consumers, the Vienna Plus model also grinds, tamps, and brews gourmet coffee. The grinder is a high quality and adjustable burr grinder that allows you the ability to customize the grind of your coffee according to your own preferences. Nothing about this machine is one size fits all. It also offers a 57-ounce removable water tank. The goal of Saeco, with this model of espresso maker is to allow consumers to have coffee house quality coffee from home and they deliver.